Friday night after Nicki got off work we went shopping for ice skates, since the public skate at the arena was BYOS (Bring Your Own Skates) and neither one of us owned a pair. 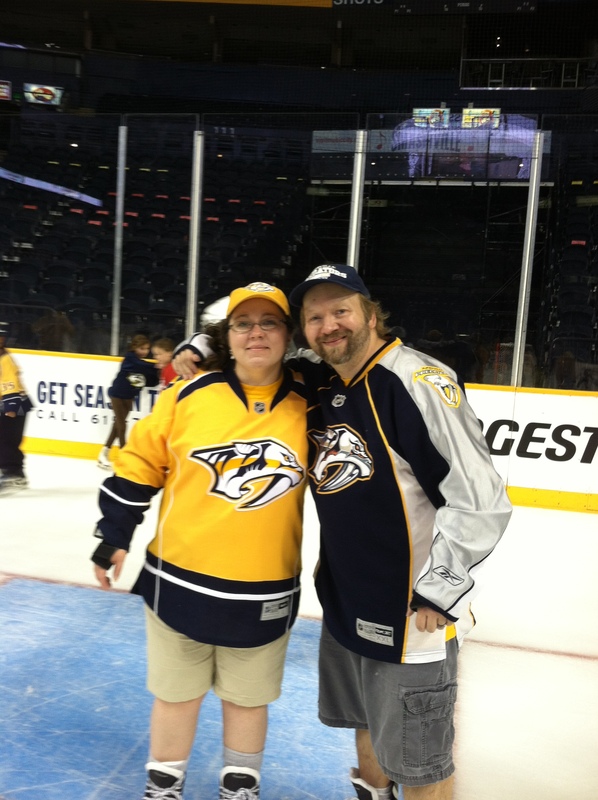 To be honest, neither of us had been on a pair of skates in years! 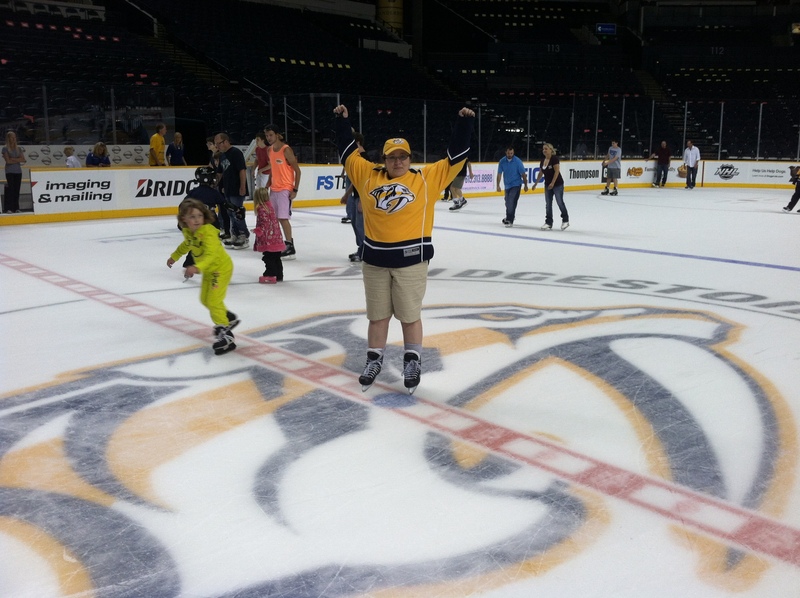 The chance to skate on the Preds’ home ice was just too cool of a chance for us to pass up, so on the hunt for ice skates we went. We had no idea how hard it would be to find a pair in Memphis- try just about impossible! We ended up stopping by the Mid-South Ice House in Olive Branch and hoped they would have a skate shop- they did! We both found a pair we liked- and that were on sale! Nicki paid the nice man and headed home. We’ll be back to the Ice House later for more ice time and to catch some college hockey there later. 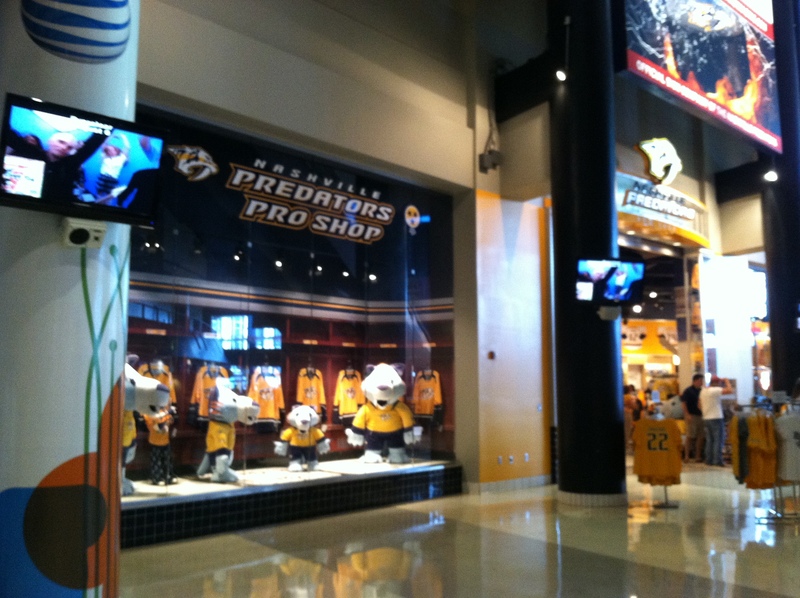 And the guy behind the counter said he had some Preds merch on order so Nicki will be back for sure! 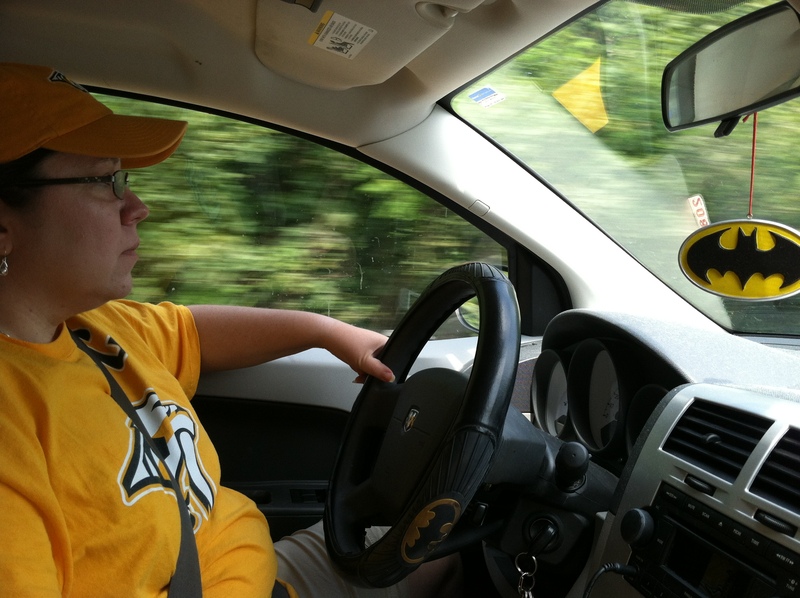 The next morning we loaded up the Batmobile and headed up I-55 to Memphis. 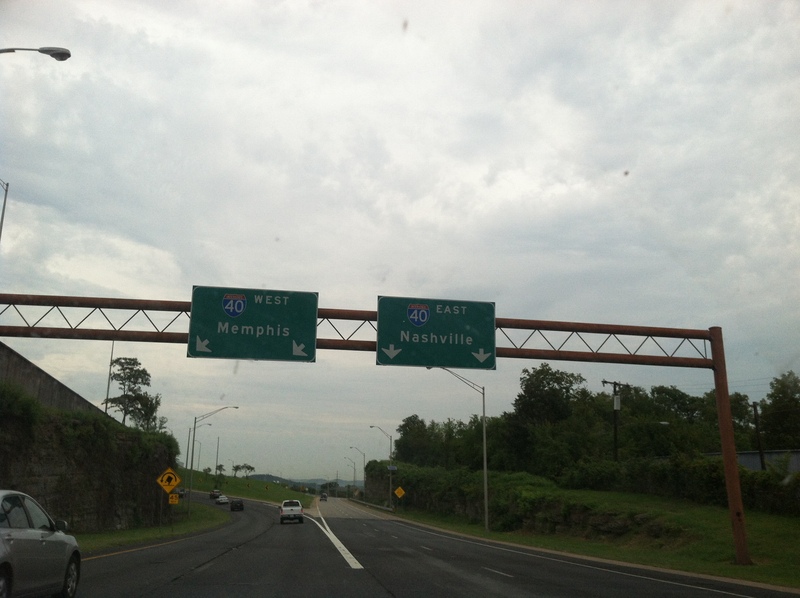 It’s about a 3hr or so drive to Nashville, and once out of Memphis it’s pretty much a straight shot up I-40. 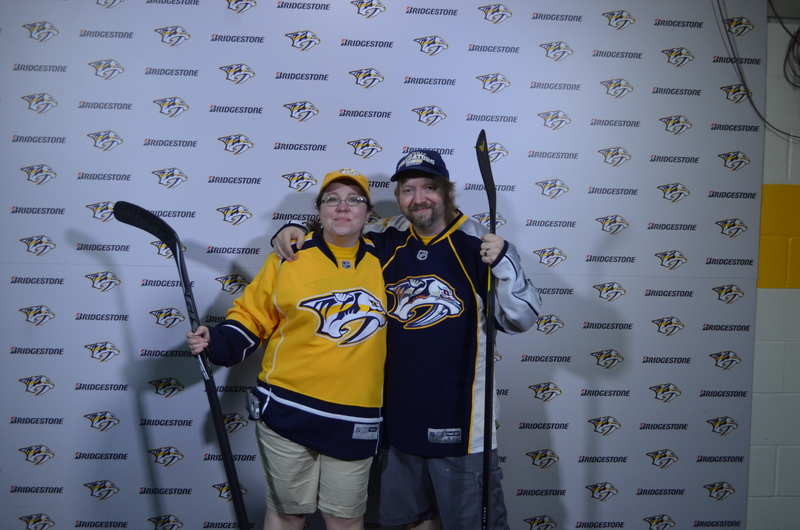 We both were wearing our newest gold tees with the latest Predators logo on them. 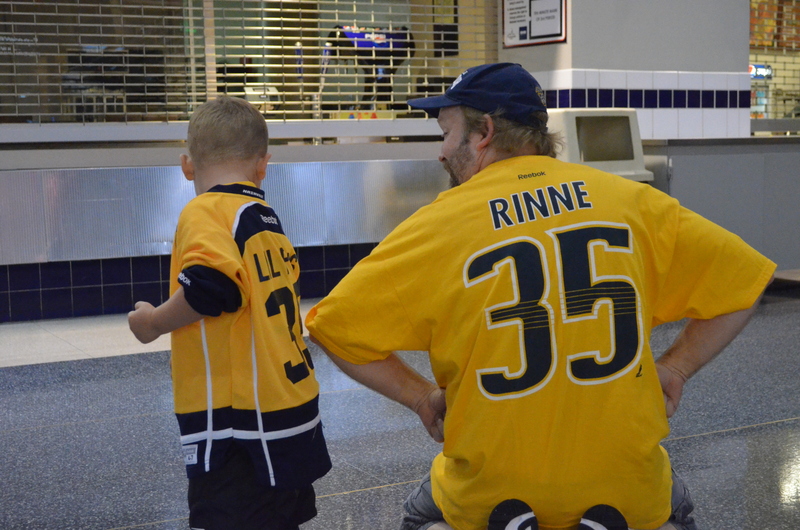 Nicki was wearing #6, captain Shea Weber on the back of hers, and I had #35, Pekka Rinne (the Preds’ goalie) on mine. 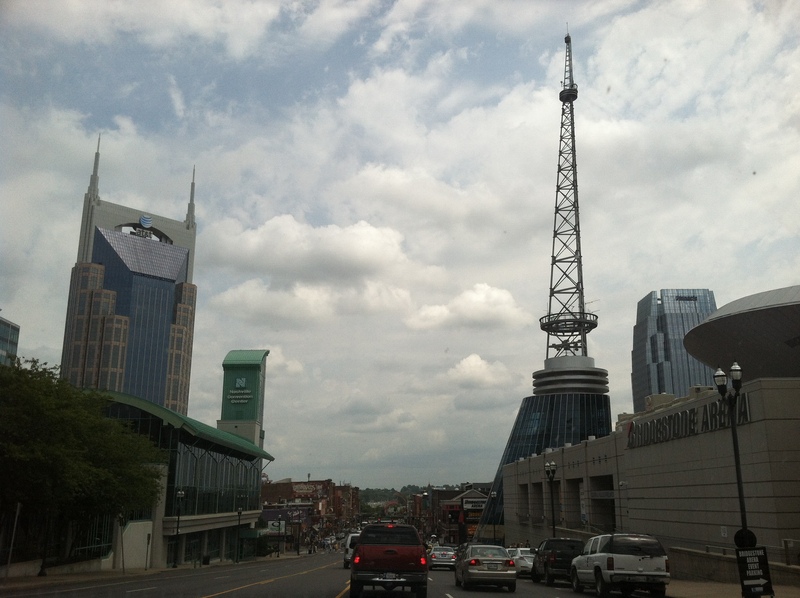 We hit Broadway in Nashville around noon. 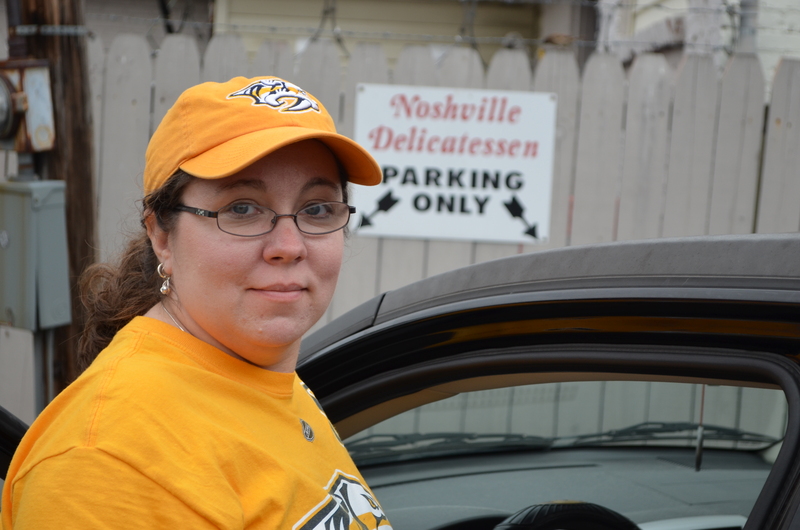 After finding a parking garage up the street we grabbed our skates and cameras and headed back down the street to Broadway and the Bridgestone Arena. That’s it on the right, and the Bat-building on the left. When we got to the plaza we saw a new banner featuring Nicki’s boy Shea. 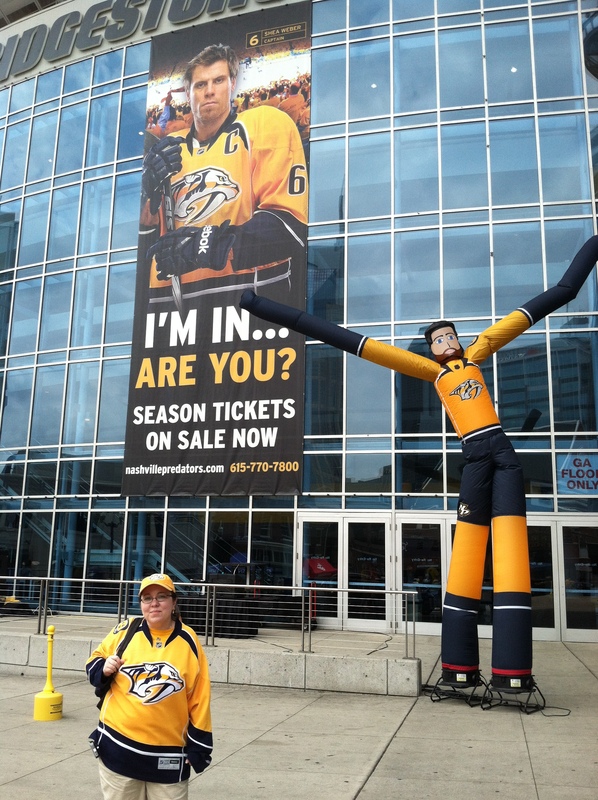 I have to admit I misread the banner as, “I’m in you.” Nicki and I both had a good laugh over that. 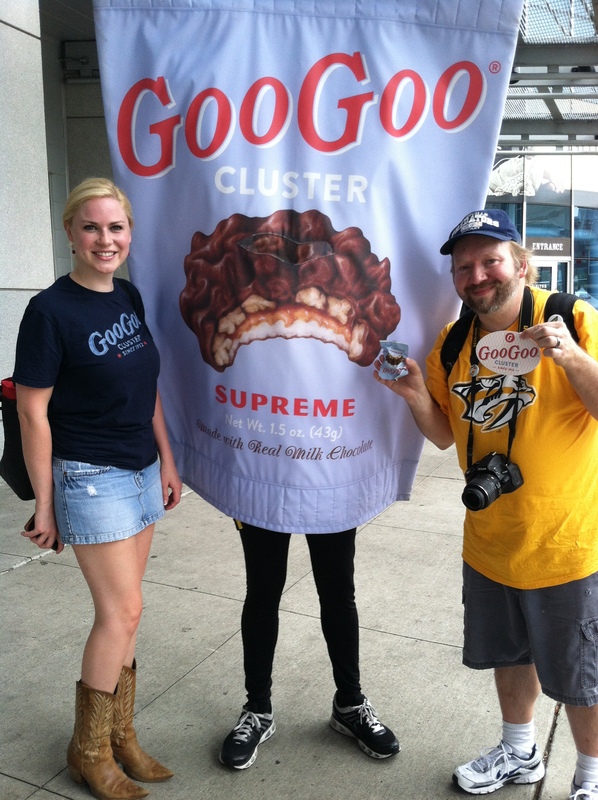 There was a party going on in the plaza and we both got a free GooGoo Cluster (which are made in Nashville) and GGC sticker before entering the arena. I ate the GooGoo Cluster later while waiting in line for the used equipment sale inside. Quite tasty! 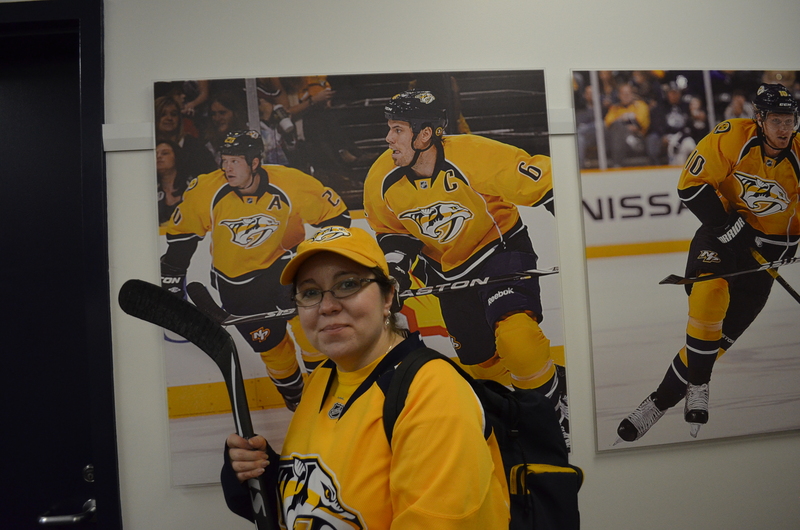 After going inside Nicki visited the Predators Pro Shop. 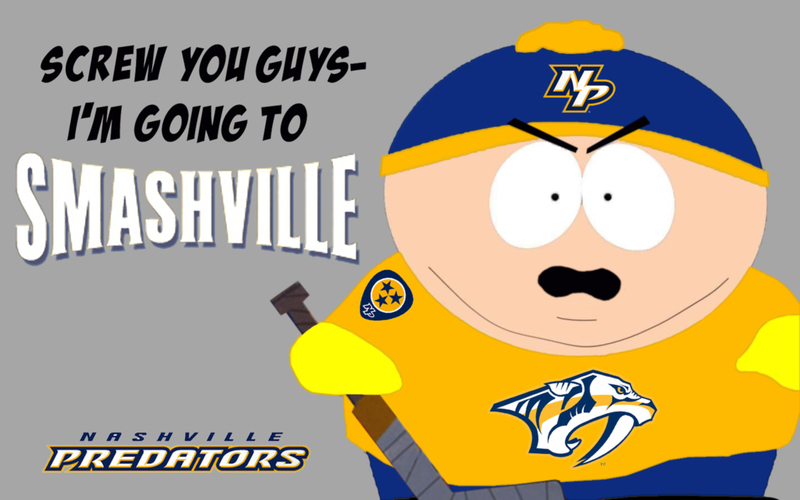 It’s hard to find Predator merchandise in Memphis and Nicki’s lucky to find Titan’s merch in town, so when she get’s a chance to shop in Nashville she’s on the lookout for new Preds gear. I visited the men’s room- hey, it was a long drive. 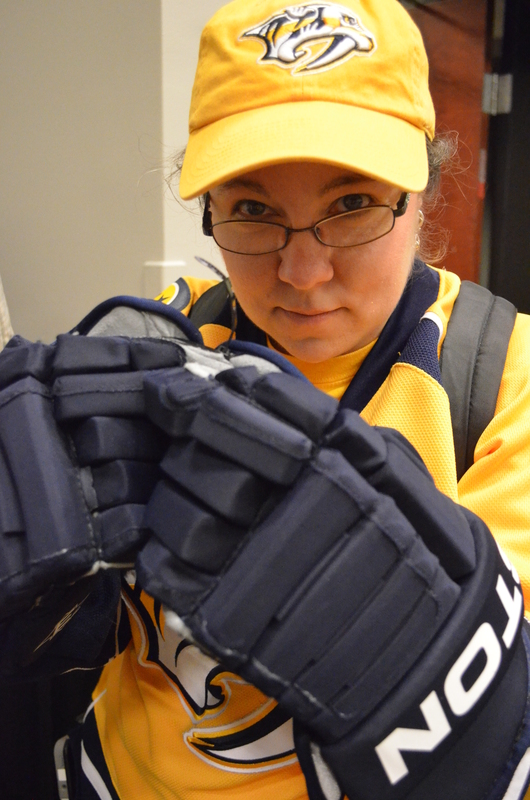 The next thing we did was wait in line for the Predators’ used equipment sale. The line was long, but moved along pretty fast. While we were waiting we got a couple free soda and popcorn from the concession stand in front of us. That hit the spot after walking to and around the arena. It was also nice to have something wash down the GooGoo Cluster I had been handed earlier. They’re good, but RICH! The season ticket holders got to go in earlier than everyone else, but most had already gone in by the time we got in line. The staff seemed to have everything moving along smoothly, and there was a lot of items left when we got in. 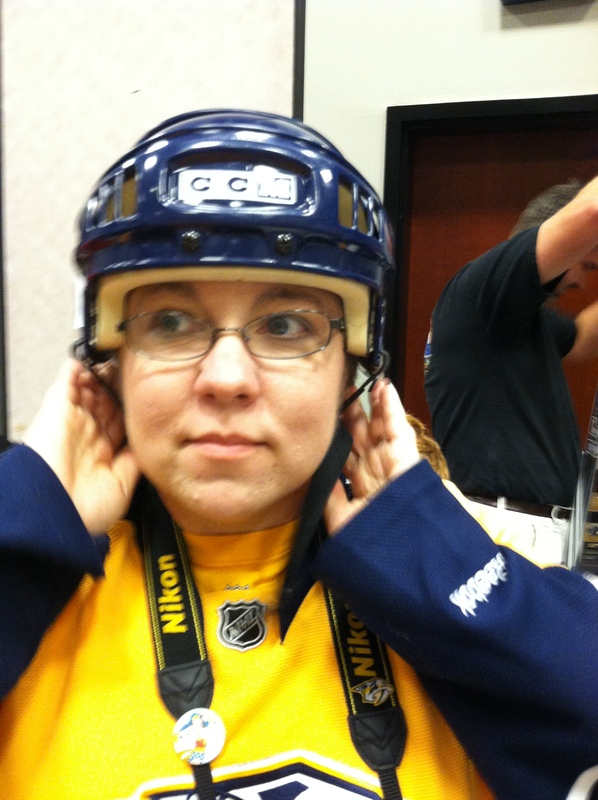 Nicki couldn’t find a helmet that fit her, but was able to pick out a couple hockey sticks she liked. 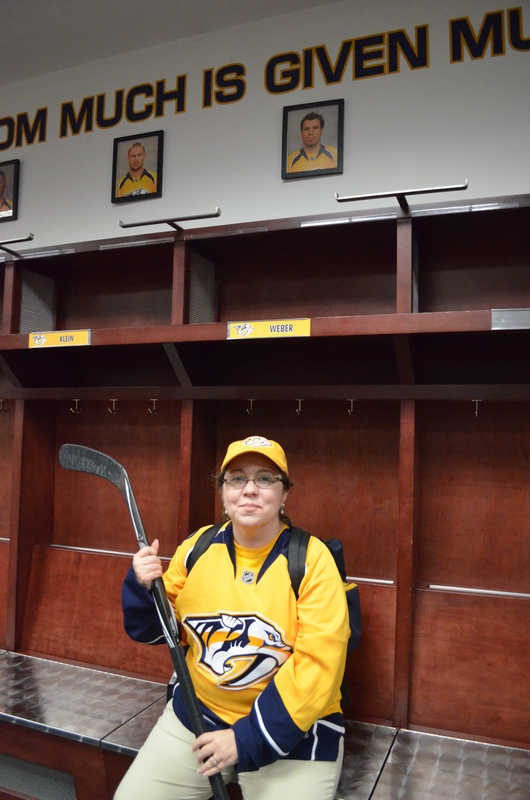 She also picked up a couple player locker name plates and a pair of hockey socks. 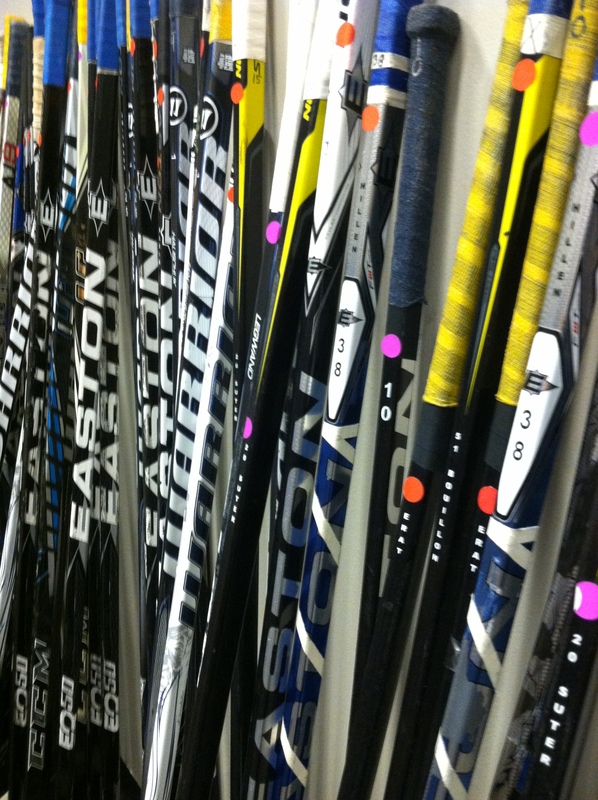 While we were checking out at the equipment sale we asked about the tours of the locker room. On our way to the elevators that would take us downstairs to the tours, we saw the Schenk Photography booth. We had gotten a couple greenscreen photos from them at games before. This time they were doing free PRED SCHEDules. 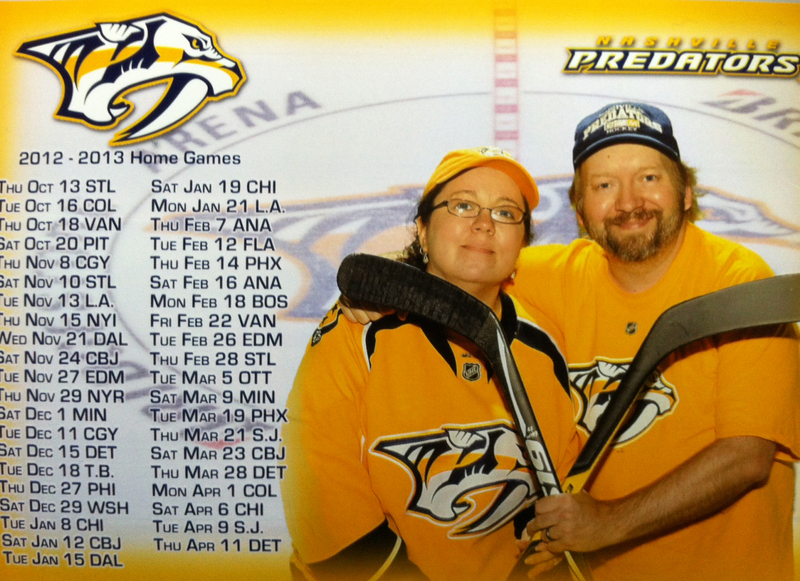 We didn’t realize until after we got the photo that it looks like I’m trying to cut Nicki’s head off with my stick! Sorry, Babe. We headed down to the Event Level for our tour of the locker room. It was great that they were having an open house for the fans, and Nicki was getting more giddy the closer we got. I was digging it, too! After going down a long hallway from the elevators, we turned right to get in line. 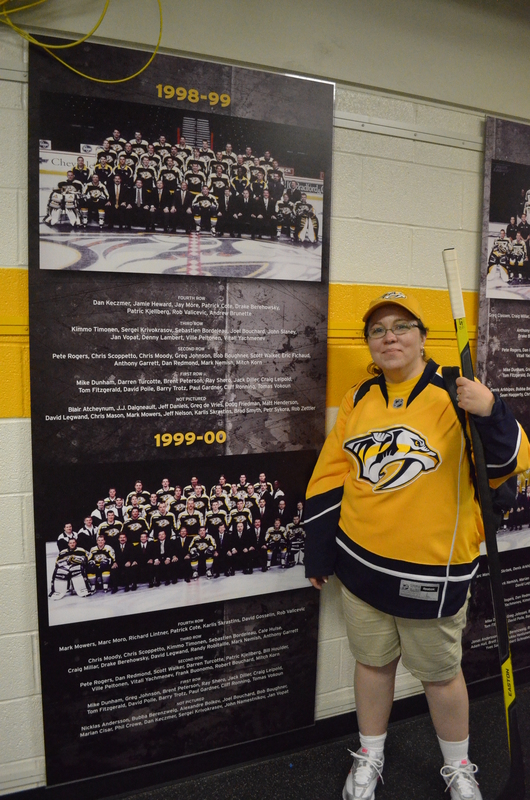 There were player stats on the right side of the wall, and as we got to some stanchions we turned around to the left and team photos lined that wall. As we headed down this hallway we spotted a familiar interview background. Yep, this is where the coaches and players do interviews during or after games for TV. Yeah, we both were seriously geeking-out by now. The line moved along pretty well and soon it was our turn to head down the hallway that leads to the locker room. 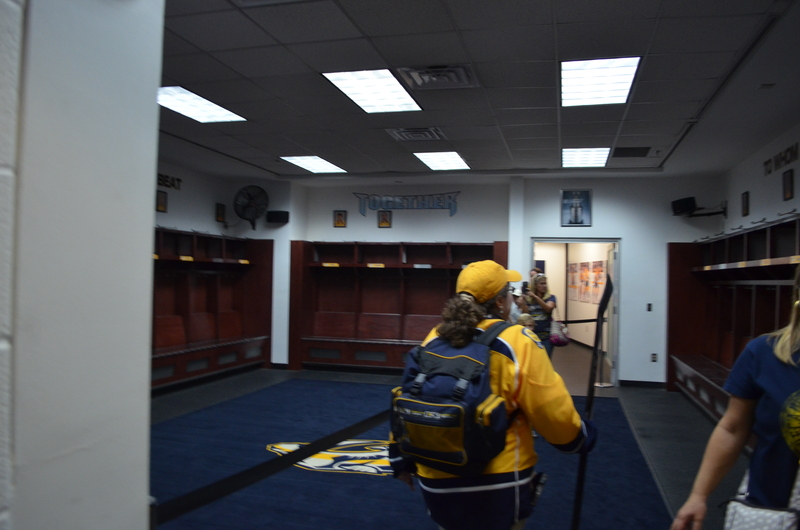 It’s also the same hallway the Preds head down to the ice- right through those doors at the end. 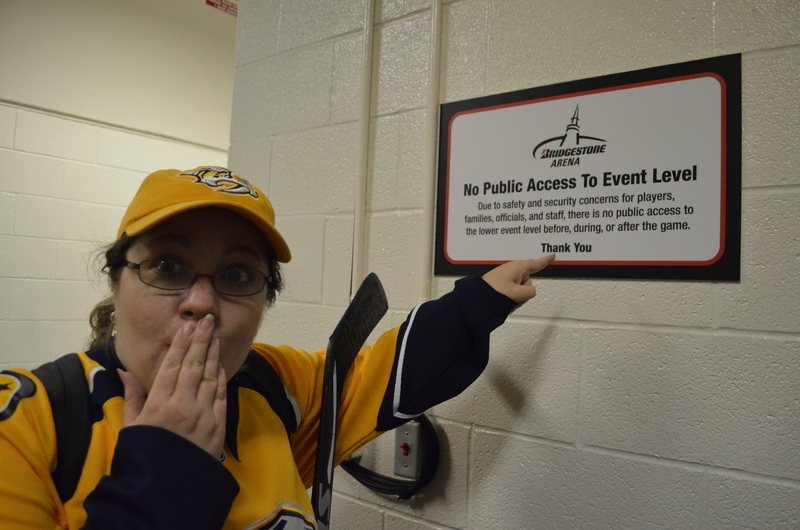 A few seconds later we were in the Preds’ locker room! It seems a bit smaller in person than on TV, but man it was cool to be there! 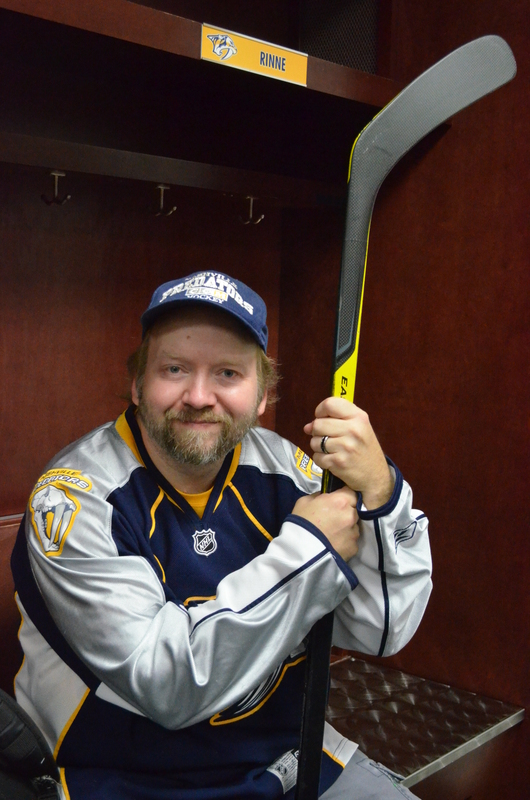 Nicki got a couple shots of me sitting in Pekka’s locker. 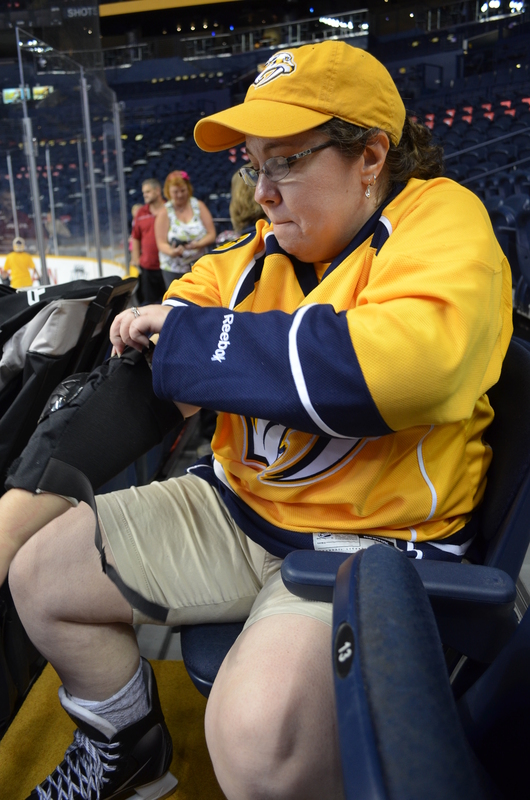 Then I got a few shots of Nicki sitting in Shea Weber’s locker. I’m so proud we didn’t have to call security to get her out of it! As we left Nicki got to get her picture made with Shea…well, sort of. 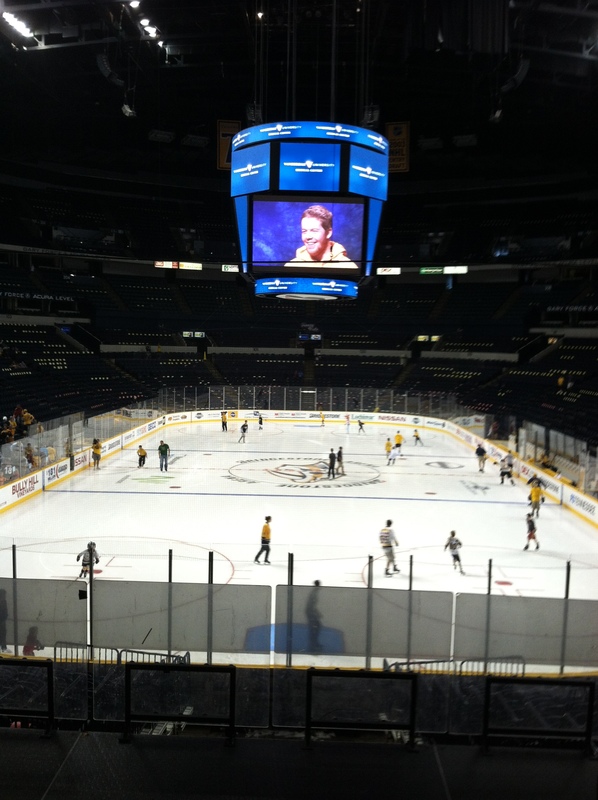 After the tour we headed back upstairs and took a few shots of the ice and arena. It was still a few minutes early to skate, but noticed folks were gathering on the other side of the rink so we headed that way. 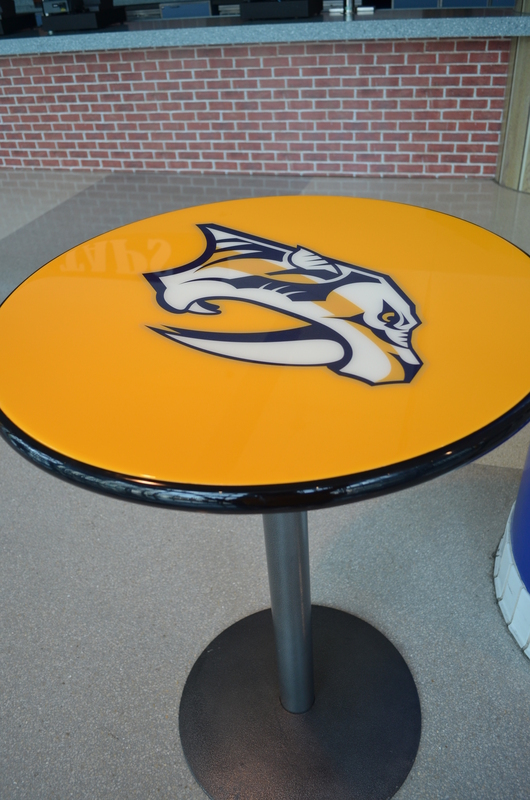 We stopped along the way to take some shots of the inside of the arena- we soooooo want one of these tables! One day we will have a sports-bar/fan-room. We then noticed folks were getting out on the ice. 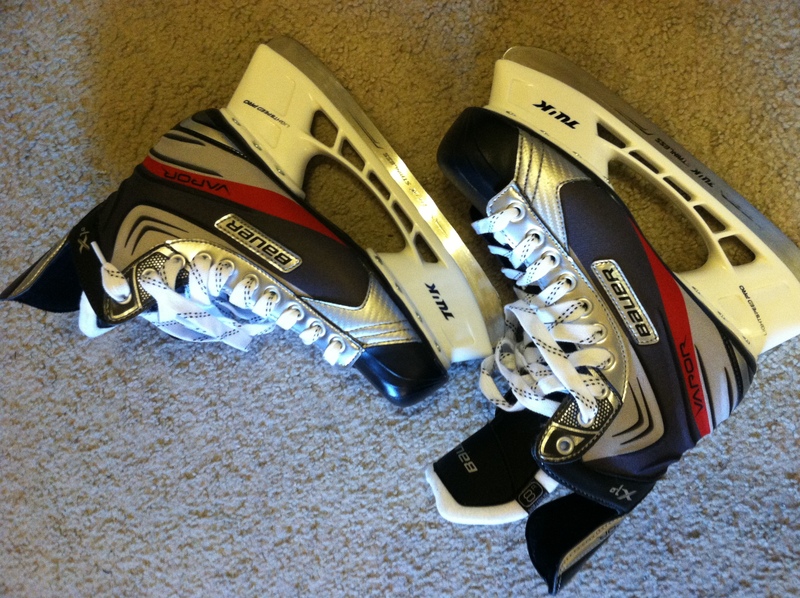 Time to skate!!! We found out we had to sign a release after we got all suited up, so off came the skates and back up the stairs to the sign-in table we went. Once signed up we laced up and took turns going out on the ice. We both had wrist guards and Nicki brought elbow pads, too- just in case..! 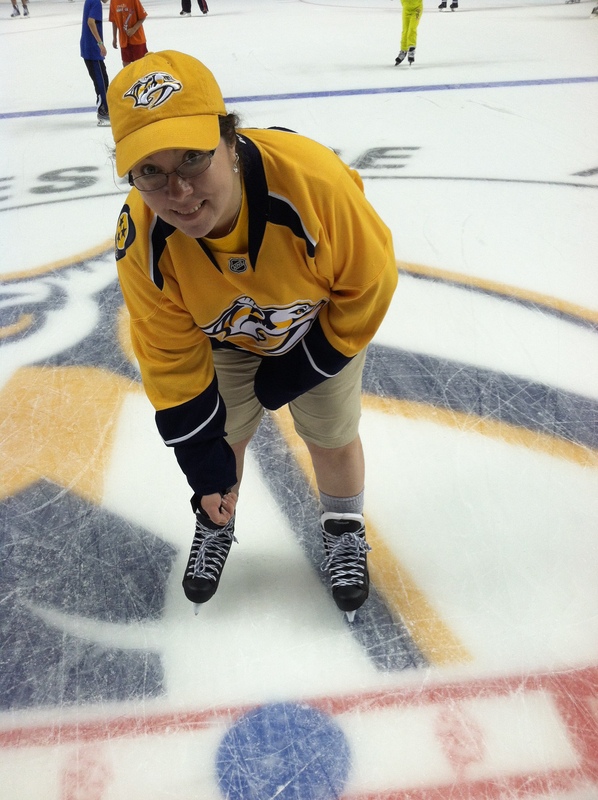 Nicki was the first to make it out to center ice. 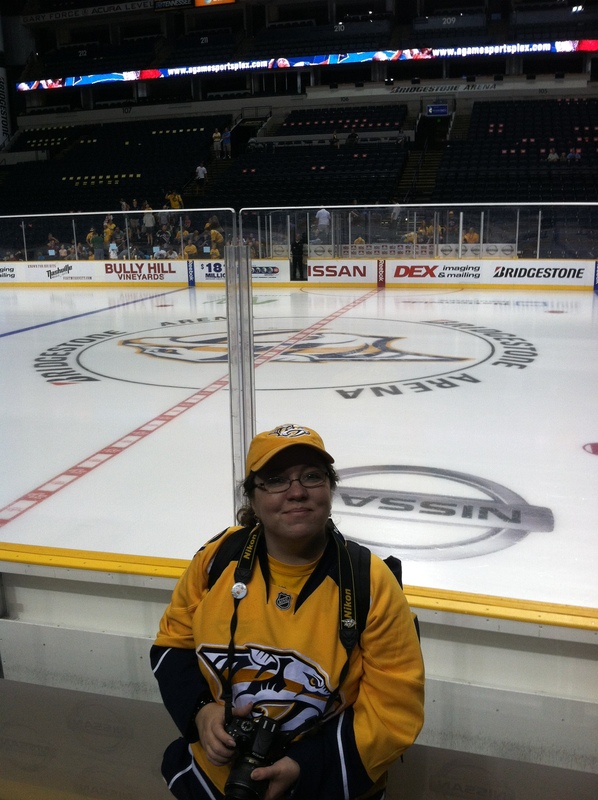 She was a happy hockey fangirl! I was so glad we got to make the trip, even if it was just for a few hours- it was so worth it! We had to do a face-off shot, but there was not getting that smile off her face! Nicki said she can no check this off of her bucket list. 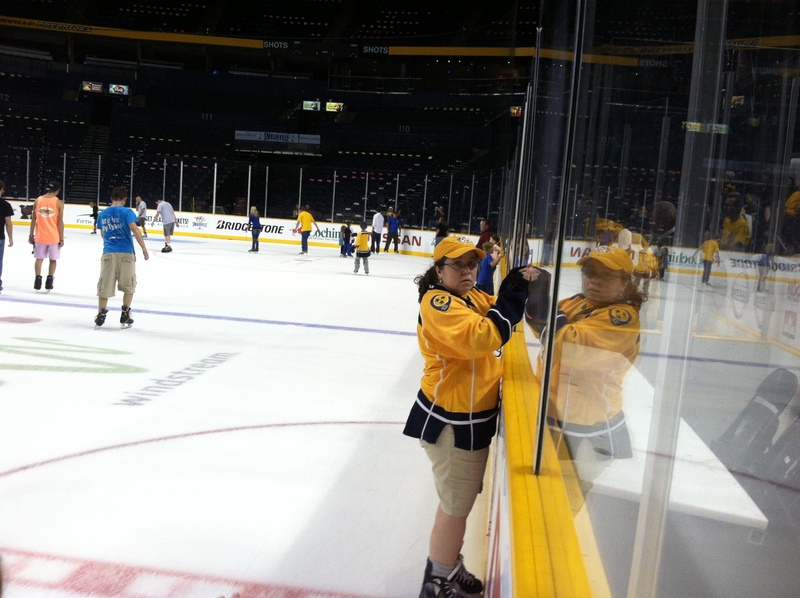 That’s the two of us hanging out in the crease at the Zamboni entrance end of the ice. This is Pekka’s office cubicle. This little guy was great! 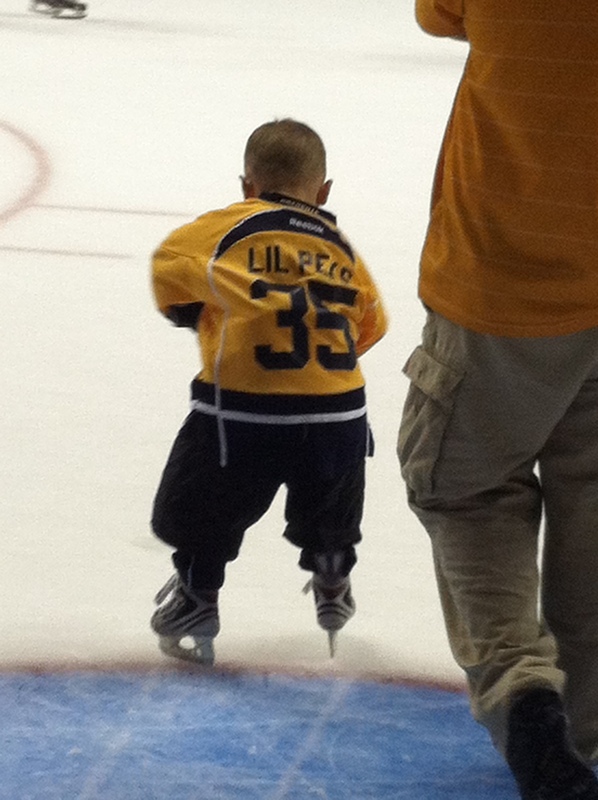 He had #35 and “LIL PEKS” on the back of his jersey and was guarding the crease just like Pekka! 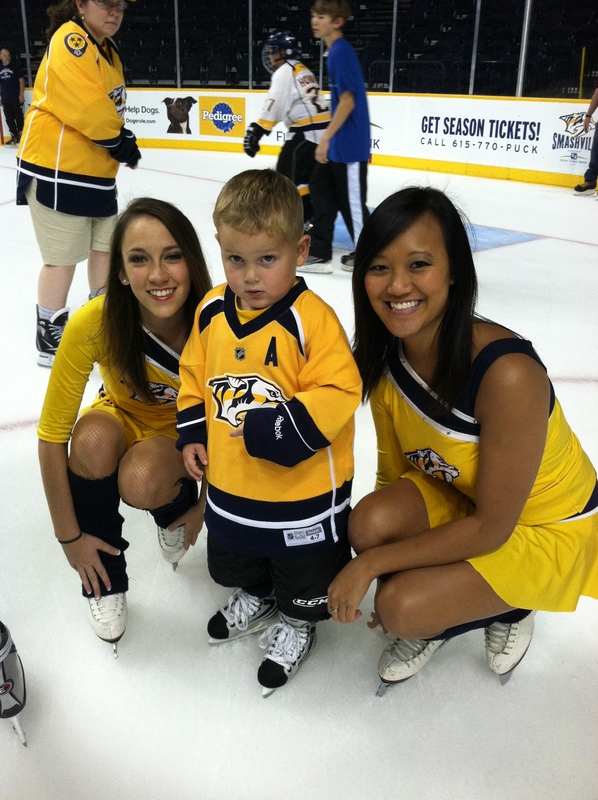 As you can see he’s already a chick magnet as he poses with a couple of the Nashville Predators Ice Girls. Nicki and I took turns sitting in the penalty box. That was pretty sweet, too. After about an hour or so of skating our feet said it was time to call it quits. Like I said, it’s been quite a while since either of us have been on skates, but we both look forward to coming back for some more ice time in Nashville. Until then we’ll be practicing at the Ice House in Olive Branch. It’s not too far from us in DeSoto County. 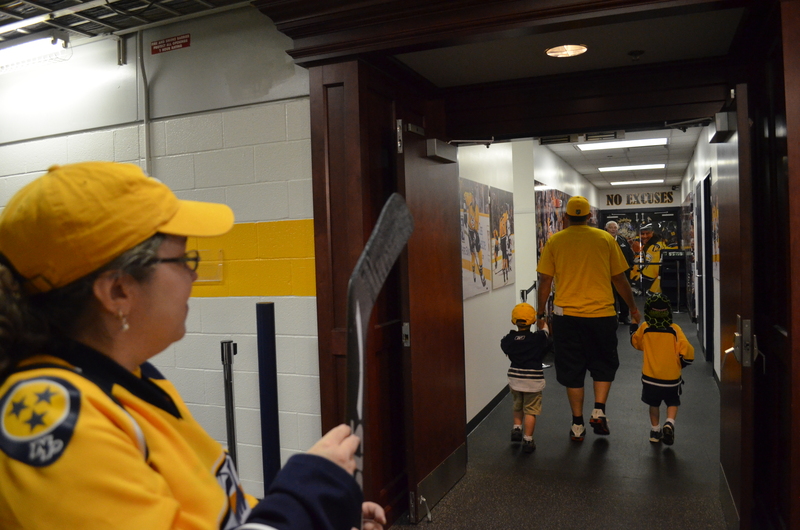 We packed up our skates and pads and headed back up to the main concourse and towards the exit. We hated to leave, but we were both getting hungry and wanted to try to stop by Opry Mills Mall before heading out of town. 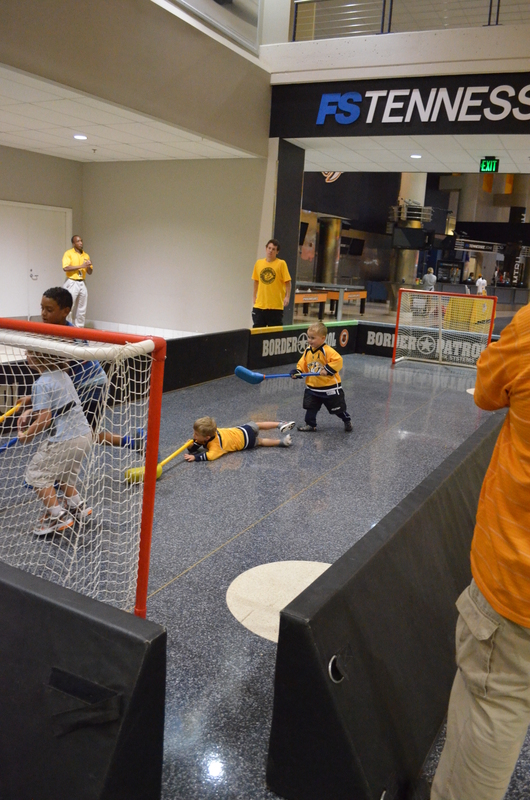 On our way out we saw our little buddy “Lil Peks” playing hockey with some kids. They were having a blast and hated to quit, but it was time for the staff to start shutting down an packing up everything. I tried to get him to show Nicki the back of his jersey, but he kept trying to show me it. After we said goodbye Lil’ Peks and his dad headed back to the ice to watch people skate. 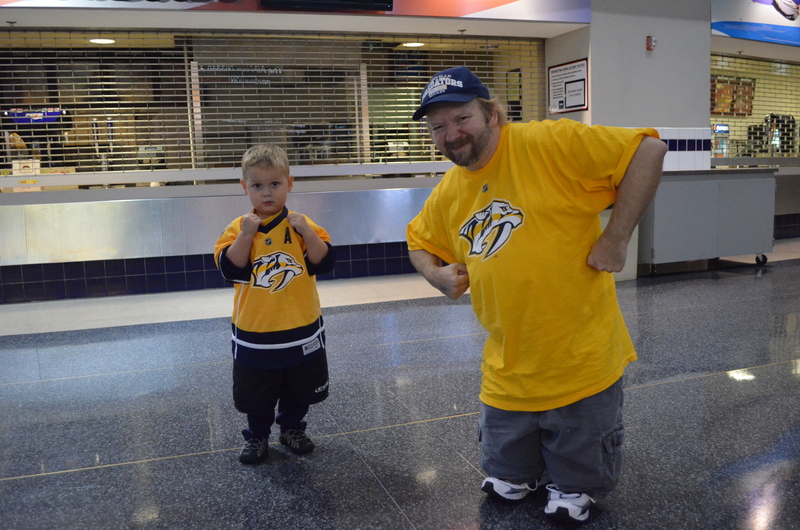 This little hockey fan wasn’t ready to call it a day yet. People have got to stop having such cute kids like Lil’ Peks, here- or we’re going to want to have one ourselves. And that means I would have to give up my Batcave! I don’t know, having a little boy or girl like this just might be worth it. Hmm…maybe I could have a Bat-closet..? 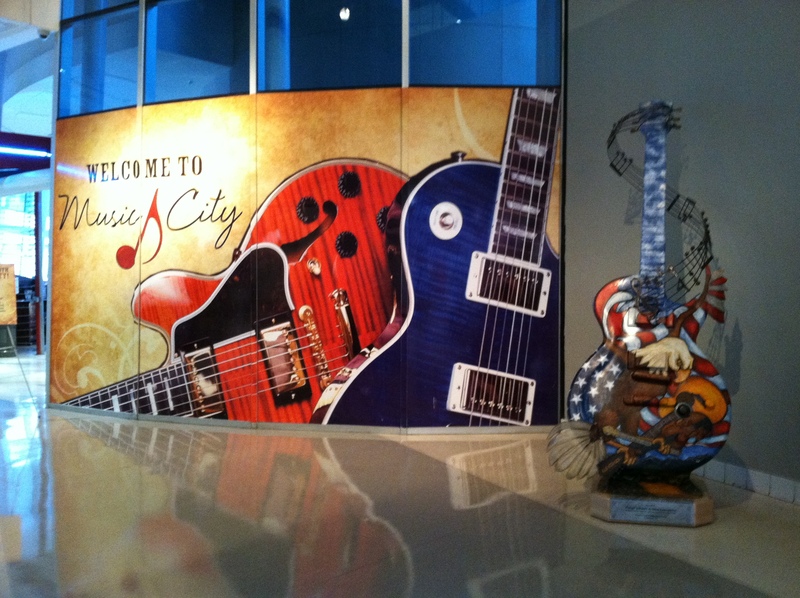 Inside by the Nashville Visitor Center there was this cool mural and custom guitar. 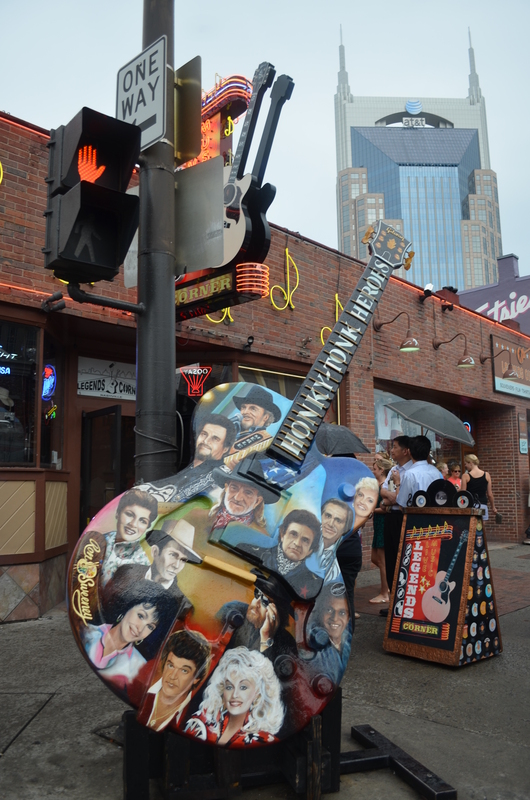 It was one of the 10′ tall fiberglass guitars for Nashville’s GuitarTown Project. 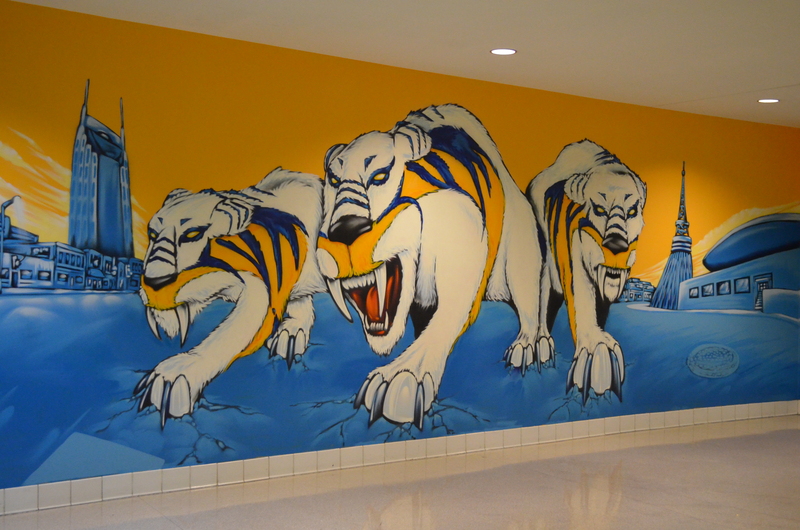 Very similar to the Germantown horses or U of M Tigers around Memphis. 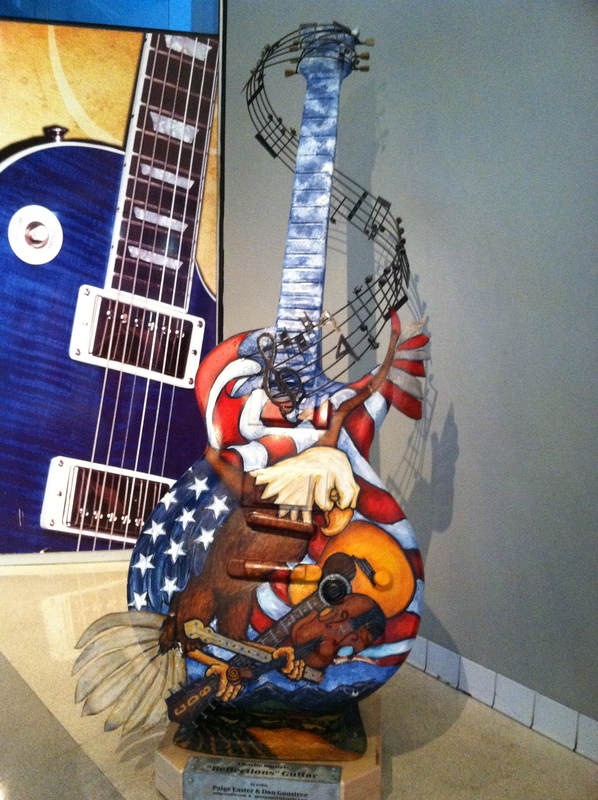 This guitar was called “Reflections” and created by artists Paige Easter and Dan Goostree. It had been raining while we were inside, and was still sprinkling a bit as we left the arena. Our camera lenses kept wanting to fog up! 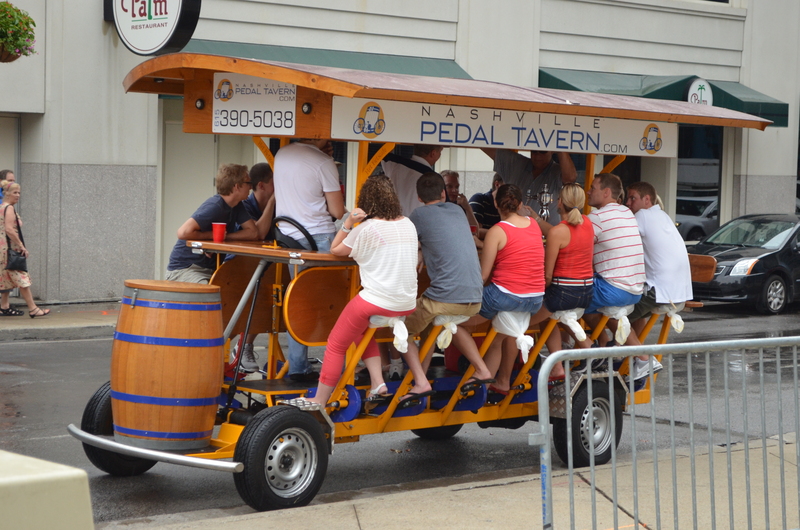 Parked just outside the arena was a Nashville Pedal Tavern! How cool is this?! Had never seen one before, but later we saw it by the river at the other end of Broadway. We crossed Broadway and headed up 5th Ave. Across the street from the arena we spotted another guitar outside Legends Corner. This one covered in famous country music performers by Nashville artist Ron Sweeney. 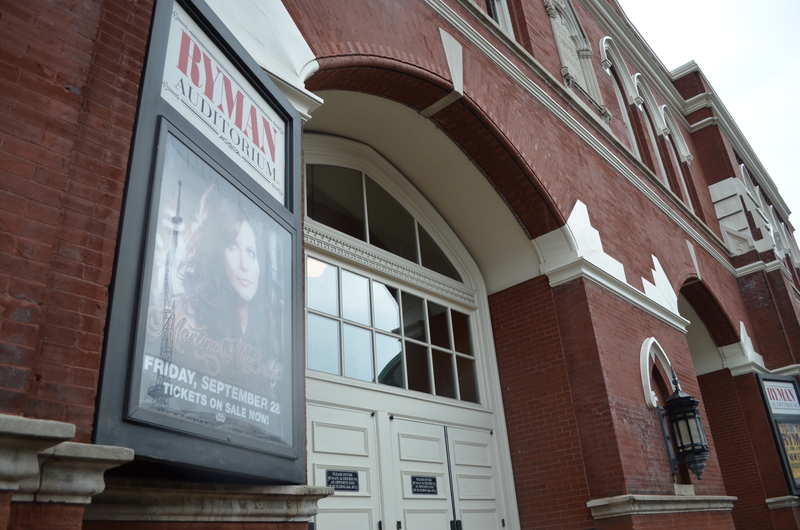 Just up the street was the famous Ryman Auditorium – former home to the Grand Ole Opry. 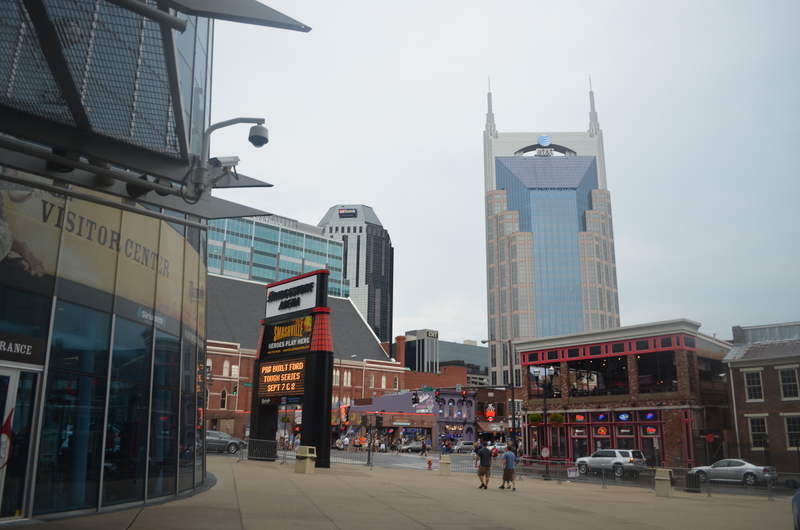 Just behind the Ryman is the “Batman Building“, also known as the AT&T Building. 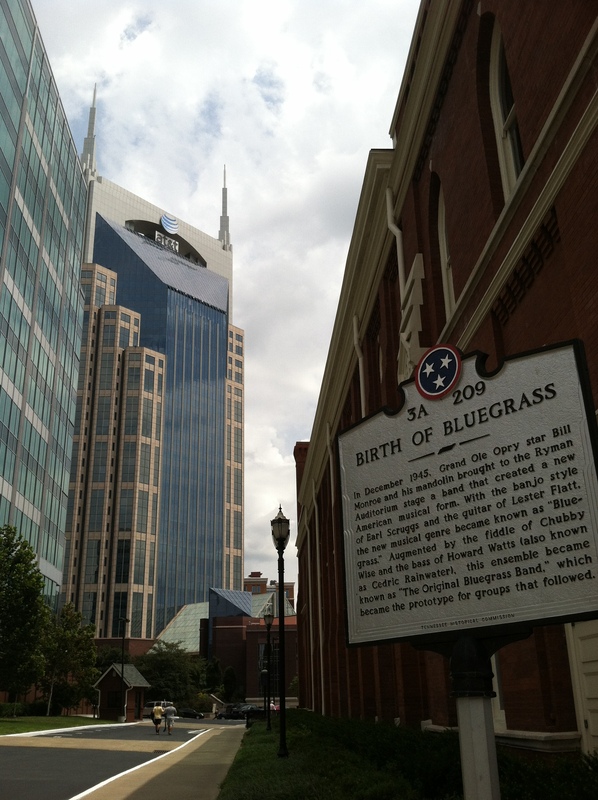 At 617′ and 33 stories it is currently the tallest building in the state of Tennessee. Like the Space Needle in Seattle, if I can see the Bat-building I know where I am in the city. 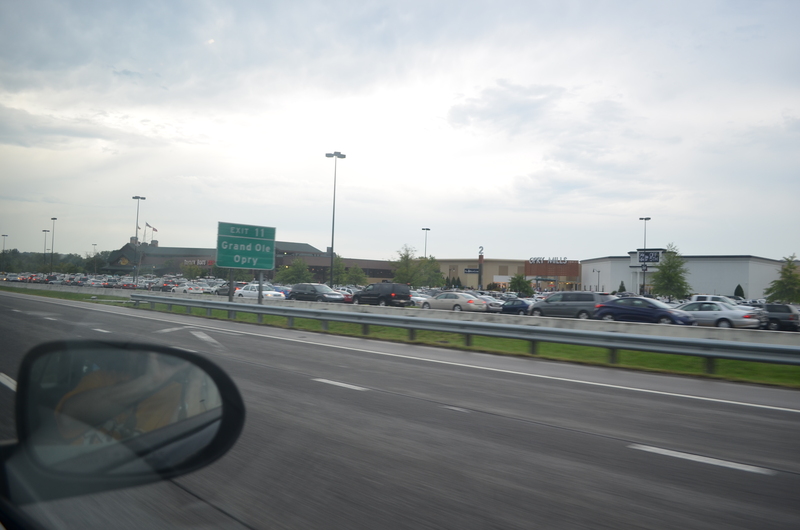 We had planned on stopping by the Opry Mills Mall, but timing was bad this trip. It had recently re-opened after the floods a couple years ago, and since it was Tax Free Weekend in Tennessee the place was packed! Even if we could get into the parking lot, finding a space and getting back out again would have been nuts. 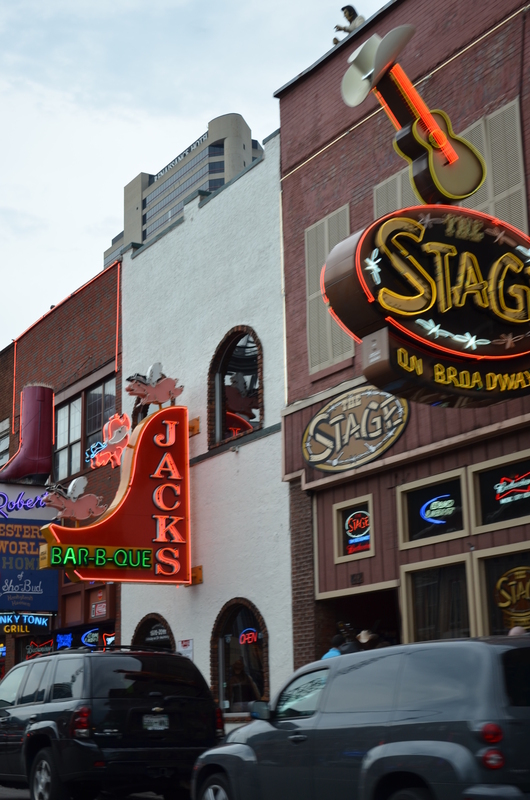 We decided to come back on a future trip to Nashvegas. 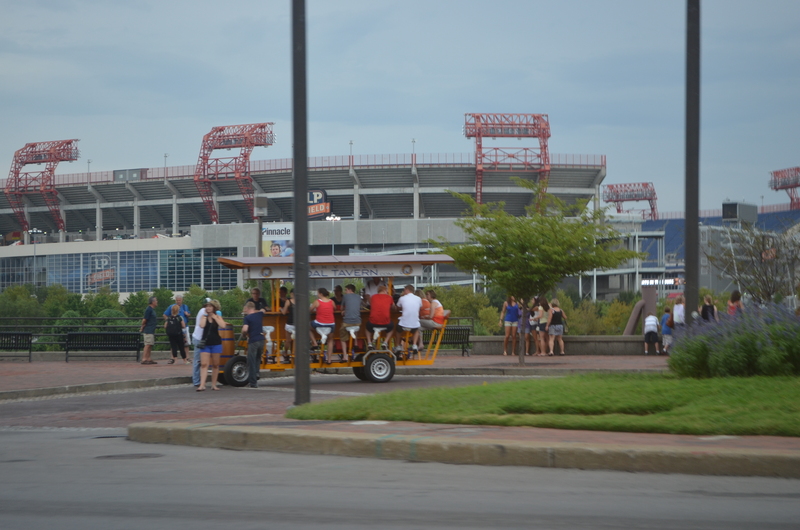 We headed back towards downtown and Broadway, and passed the Pedal Tavern parked beside the Cumberland River, just across from LP Field– the home of the Tennessee Titans. 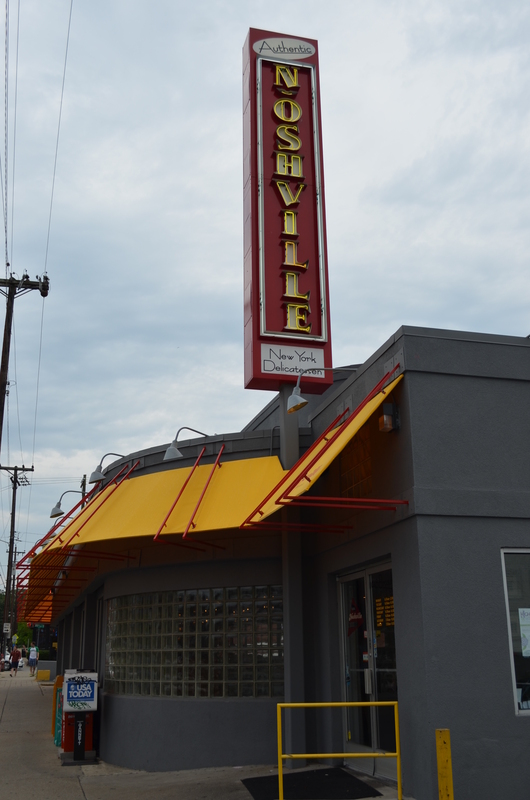 After saying goodbye to the Bridgetsone and Preds we stopped at Noshville. 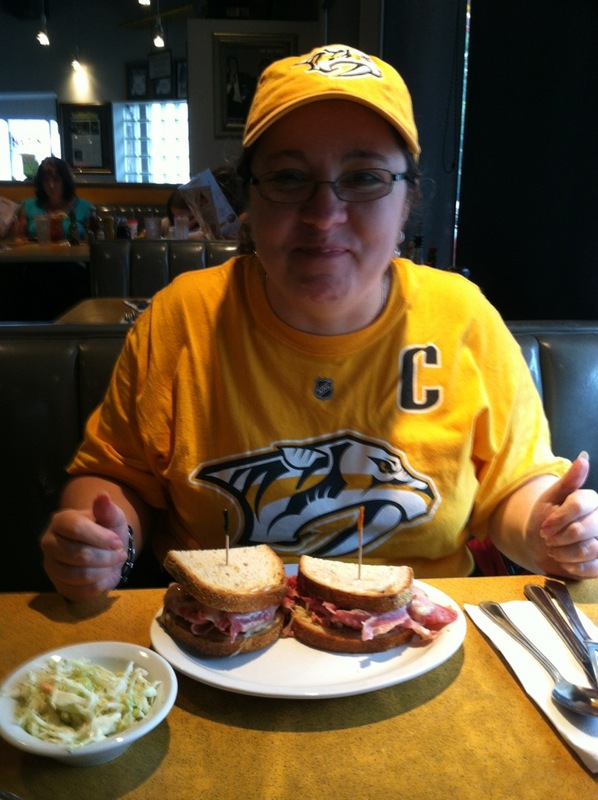 We had breakfast the last time we were in Nashville and wanted to try lunch/dinner there before heading home. I got the French dip, fries, and a bowl of their deli pickles. I didn’t get a chance to try the pickles last time I was there. They weren’t fried, and a bit different than what I’m used to having, but man were they good. Both sets of my grandparents made homemade pickles and I hate I never learned how! Nicki got the corned beef sandwich and coleslaw. She let me try a piece of corned beef (sans mustard) and it was amazing. Might have to get it next time we stop back in. We hated to leave Nashville, but wanted to be home before too late. I hate driving late at night, although by now the Batmobile could probably find its way home by itself- but why take the chance..?! 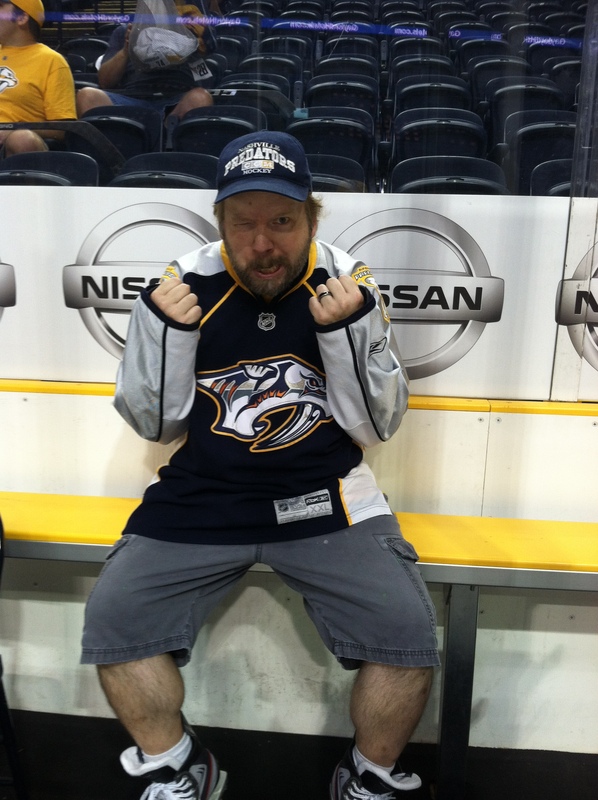 We will be back to SMASHVILLE and Noshville soon. 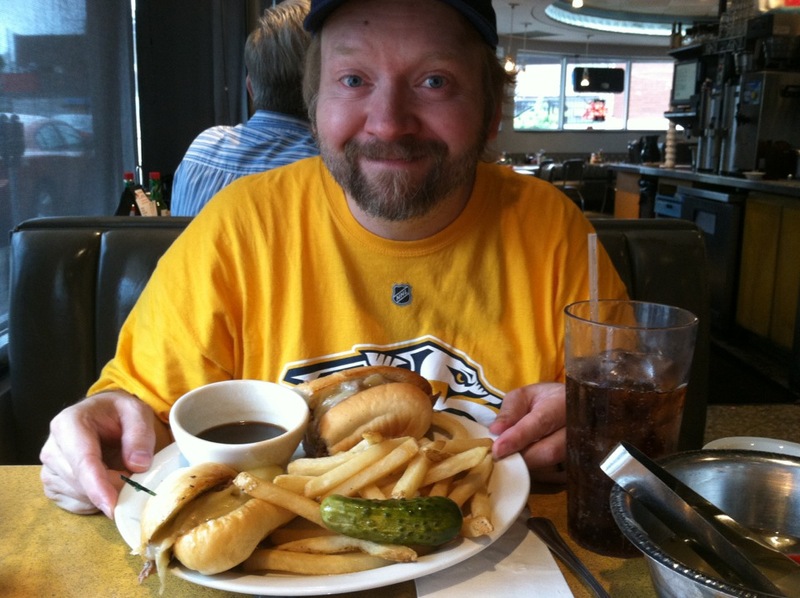 Hockey season is just around the corner, and I always have room for more pickles!